I've made my One Layer Wednesday card (on Thursday! 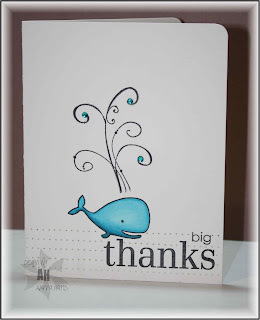 )...I was making some thank you cards with Moby, the whale stamp from A muse, and piercing the spout on top of his head when I suddenly remembered Susan's challenge for the week to use a flourish on a OLC. I pulled out one of my first stamps sets, a flourish set from Autumn Leaves, and found the perfect-although-kind-of-large flourish for Moby. I coloured Moby with copics and added some bling to his spout. Because the left side of the card seemed kind of empty, and because Moby looked like he was flying in the air rather than floating in water, I added a few lines of piercing to ground him in a very subtle way. I think it works! this is so cute!! 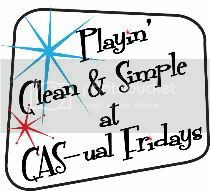 you and I had similar ideas :-) great cas card!! This is waaaaaay too stinkin' cute! Great use of the flourish! You know I love Moby, but that flourish is all kinds of cool. Great use of the flourish...and coloring that big whale! I always have trouble coloring in bigger images, but you nailed this! How cute is this!!! I love the little whale...and the flourishes are so perfect with him!!! Awesome! This is just way too cute - love the whale the the flourish is great. Great piercing on the bottom. Love the piercing water and the flourish spout too! Oh my goodness, such a sweet card and the flourish is perfect for the whale's water spout!